Muscle Energy Techniques: A revolution has taken place in manipulative therapy involving a movement away from high velocity/low amplitude thrusts (HVT – now commonly known as ‘mobilization with impulse’ and characteristic of most chiropractic and, until recently, much osteopathic manipulation) towards gentler methods which take far more account of the soft tissue component (DiGiovanna 1991, Lewit 1999, Travell & Simons 1992). Greenman (1996) states that: ‘Early [osteopathic] techniques did speak of muscle relaxation with soft tissue procedures, but specific manipulative approaches to muscle appear to be 20th century phenomena.’ One such approach – which targets the soft tissues primarily, although it also makes a major contribution towards joint mobilization – has been termed muscle energy technique (MET) in osteopathic medicine. There are a variety of other terms used to describe this approach, the most general (and descriptively accurate) of which was that used by chiropractor Craig Liebenson (1989, 1990) when he described muscle energy techniques as ‘active muscular relaxation techniques’. Muscle energy techniques evolved out of osteopathic procedures developed by pioneer practitioners such as T. J. Ruddy (1961), who termed his approach ‘resistive duction’, and Fred Mitchell Snr (1967). As will become clear in this chapter, there also exists a commonality between Muscle energy techniques and various procedures used in orthopaedic and physiotherapy methodology, such as proprioceptive neuromuscular facilitation (PNF). Largely due to the work of experts in physical medicine such as Karel Lewit (1999), MET has evolved and been refined, and now crosses all interdisciplinary boundaries. MET has as one of its objectives the induced relaxation of hypertonic musculature and, where appropriate (see below), the subsequent stretching of the muscle. This objective is shared with a number of ‘stretching’ systems, and it is necessary to examine and to compare the potential benefits and drawbacks of these various methods (see Box 1.1). MET, as presented in this book, owes most of its development to osteopathic clinicians such as T. J. Ruddy (1961) and Fred Mitchell Snr (1967), with more recent refinements deriving from the work of people such as Karel Lewit (1986, 1999) and Vladimir Janda (1989) of the former Czechoslovakia, both of whose work will be referred to many times in this text. In the 1940s and 50s, osteopathic physician T. J. Ruddy developed a treatment method involving patient-induced, rapid, pulsating contractions against resistance which he termed ‘rapid resistive duction’. It was in part this work which Fred Mitchell Snr used as the basis for the evolution of MET (along with PNF methodology, see Box 1.1). Ruddy’s method called for a series of rapid, low amplitude muscle contractions against resistance, at a rate a little faster than the pulse rate. This approach is now known as pulsed MET, rather than the tongue-twisting ‘Ruddy’s rapid resistive duction’. As a rule, at least initially, these patient-directed pulsating contractions involve an effort towards the barrier, using antagonists to shortened structures. This approach can be applied in all areas where sustained contraction muscle energy technique procedures are appropriate, and is particularly useful for self-treatment, following instruction from a skilled practitioner. Ruddy suggests that the effects include improved local oxygenation, venous and lymphatic circulation, as well as a positive influence on both static and kinetic posture, because of the effects on proprioceptive and interoceptive afferent pathways. Ruddy’s work formed part of the base on which Mitchell Snr and others constructed MET and aspects of its clinical application are described in Chapter 3. No single individual was alone responsible for MET, but its inception into osteopathic work must be credited to F. L. Mitchell Snr, in 1958. Since then his son F. Mitchell Jnr (Mitchell et al 1979) and many others have evolved a highly sophisticated system of manipulative methods (F. Mitchell Jnr, tutorial on biomechanical procedures, American Academy of Osteopathy, 1976) in which the patient ‘uses his/her muscles, on request, from a precisely controlled position in a specific direction, against a distinctly executed counterforce’. The function of any articulation of the body which can be moved by voluntary muscle action, either directly or indirectly, can be influenced by muscle energy procedures ... . Muscle energy techniques can be used to lengthen a shortened, contractured or spastic muscle; to strengthen a physiologically weakened muscle or group of muscles; to reduce localized edema, to relieve passive congestion, and to mobilize an articulation with restricted mobility. Muscle energy techniques are particularly effective in patients who have severe pain from acute somatic dysfunction, such as those with a whiplash injury from a car accident, or a patient with severe muscle spasm from a fall. MET methods are also an excellent treatment modality for hospitalized or bedridden patients. They can be used in older patients who may have severely restricted motion from arthritis, or who have brittle osteoporotic bones. Basic science data suggests the musculoskeletal system plays an important role in the function of other systems. Research indicates that segmentally related somatic and visceral structures may affect one another directly, via viscerosomatic and somaticovisceral reflex pathways. Somatic dysfunction may increase energy demands, and it can affect a wide variety of bodily processes; vasomotor control, nerve impulse patterns (in facilitation), axionic flow of neurotrophic proteins, venous and lymphatic circulation and ventilation. The impact of somatic dysfunction on various combinations of these functions may be associated with myriad symptoms and signs. A possibility which could account for some of the observed clinical effects of manipulation. As to the methods of manipulation he now uses clinically, Stiles states that he employs muscle energy methods on about 80% of his patients, and functional techniques (such as strain/counterstrain) on 15–20%. He uses high velocity thrusts on very few cases. The most useful manipulative tool available is, he maintains, muscle energy techniques. Localization of force is more important than intensity. Localization depends on palpatory proprioceptive perception of movement (or resistance to movement) at or about a specific articulation ... . Monitoring and confining forces to the muscle group or level of somatic dysfunction involved are important for achieving desirable changes. Poor results are most often due to improperly localized forces, often with excessive patient effort. MET emerged squarely out of osteopathic tradition, although a synchronous evolution of treatment methods, involving isometric contraction and stretching, was taking place independently in physical therapy, called PNF (see Box 1.1). Fred Mitchell Snr (1958) quoted the words of the developer of osteopathy, Andrew Taylor Still: ‘The attempt to restore joint integrity before soothingly restoring muscle and ligamentous normality was putting the cart before the horse.’ As stated earlier, Mitchell’s work drew on the methods developed by Ruddy; however, it is unclear whether Mitchell Snr, when he was refining MET methodology in the early 1950s, had any awareness of proprioceptive neuromuscular facilitation (PNF), a method which had been developed a few years earlier, in the late 1940s, in a physical therapy context (Knott & Voss 1968). PNF method tended to stress the importance of rotational components in the function of joints and muscles, and employed these using resisted (isometric) forces, usually involving extremely strong contractions. Initially, the focus of PNF related to the strengthening of neurologically weakened muscles, with attention to the release of muscle spasticity following on from this, as well as to improving range of motion at intervertebral levels (Kabat 1959, Levine et al 1954) (see Box 1.1). A term much used in more recent developments of muscle energy techniques is postisometric relaxation (PIR), especially in relation to the work of Karel Lewit (1999). The term postisometric relaxation refers to the effect of the subsequent reduction in tone experienced by a muscle, or group of muscles, after brief periods during which an isometric contraction has been performed. The terms proprioceptive neuromuscular facilitation (PNF) and postisometric relaxation (PIR) (the latent hypotonic state of a muscle following isometric activity) therefore represent variations on the same theme. A further variation involves the physiological response of the antagonists of a muscle which has been isometrically contracted – reciprocal inhibition (RI). When a muscle is isometrically contracted, its antagonist will be inhibited, and will demonstrate reduced tone immediately following this. Thus the antagonist of a shortened muscle, or group of muscles, may be isometrically contracted in order to achieve a degree of ease and additional movement potential in the shortened tissues. Sandra Yale (in DiGiovanna 1991) acknowledges that, apart from the well understood processes of reciprocal inhibition, the precise reasons for the effectiveness of MET remain unclear – although in achieving PIR the effect of a sustained contraction on the Golgi tendon organs seems pivotal, since their response to such a contraction seems to be to set the tendon and the muscle to a new length by inhibiting it (Moritan 1987). Other variations on this same theme include ‘hold–relax’ and ‘contract–relax’ techniques (see Box 1.1). Lewit & Simons (1984) agree that while reciprocal inhibition is a factor in some forms of therapy related to postisometric relaxation techniques, it is not a factor in PIR itself, which is a phenomenon resulting from a neurological loop, probably involving the Golgi tendon organs (see Figs 1.1 and 1.2). Two aspects to MRT [i.e. MET by another name] are their ability to relax an overactive muscle ... and their ability to enhance stretch of a shortened muscle or its associated fascia when connective tissue or viscoelastic changes have occurred. Two fundamental neurophysiological principles account for the neuromuscular inhibition that occurs during application of these techniques. The first is postcontraction inhibition [also known as postisometric relaxation, or PIR], which states that after a muscle is contracted, it is automatically in a relaxed state for a brief, latent, period. The second is reciprocal inhibition (RI) which states that when one muscle is contracted, its antagonist is automatically inhibited. Liebenson suggests that there is evidence that the receptors responsible for PIR lie within the muscle and not in the skin or associated joints (Robinson 1982). Where pain of an acute or chronic nature makes controlled contraction of the muscles involved difficult, the therapeutic use of the antagonists can patently be of value. Thus modern MET incorporates both postisometric relaxation and reciprocal inhibition methods, as well as aspects unique to itself, such as isokinetic techniques, described later. A number of researchers, including Karel Lewit of Prague (Lewit 1999), have reported on the usefulness of aspects of MET in the treatment of trigger points, and this is seen by many to be an excellent method of treating these myofascial states, and of achieving the restoration of a situation where the muscle in which the trigger lies is once more capable of achieving its full resting length, with no evidence of shortening. Travell & Simons (1992) mistakenly credited Lewit with developing MET, stating that ‘The concept of applying post-isometric relaxation in the treatment of myofascial pain was presented for the first time in a North American journal in 1984 [by Lewit]’. In fact Mitchell Snr had described the method some 25 years previously, a fact acknowledged by Lewit (Lewit & Simons 1984). — postisometric relaxation of the muscle(s) which are being contracted. The operator’s force may overcome the effort of the patient, thus moving the area or joint in the direction opposite to that in which the patient is attempting to move it (this is an isotonic eccentric contraction, also known as an isolytic contraction). The operator may partially match the effort of the patient, thus allowing, although slightly retarding, the patient’s effort (and so producing an isotonic concentric, isokinetic, contraction). Whether to utilize Muscle energy techniques alone, or in a sequence with other modalities such as the positional release methods of strain/counterstrain, or the ischaemic compression/inhibitory pressure techniques of neuromuscular technique (NMT) – such decisions will depend upon the type of problem being addressed, with myofascial trigger point treatment frequently benefiting from such combinations (see description of integrated neuromuscular inhibition (INIT), p. 197 (Chaitow 1993)). The degree of effort is controlled (sufficient to obtain an effect but not great enough to induce trauma or difficulty in controlling the effort). What is done subsequent to the contraction may involve any of a number of variables, as will be explained. The essence of MET then is that it uses the energy of the patient, and that it may be employed in one or other of the manners described above with any combination of variables depending upon the particular needs of the case. Goodridge (one of the first osteopaths to train with Mitchell Snr in 1970) summarises as follows: ‘Good results [with MET] depend on accurate diagnosis, appropriate levels of force, and sufficient localization. 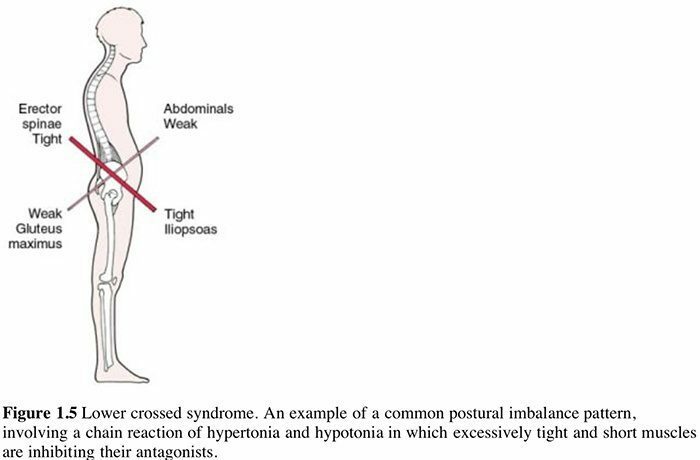 Poor results are most often caused by inaccurate diagnosis, improperly localized forces, or forces that are too strong’ (Goodridge & Kuchera 1997) (see also Box 1.3). As mentioned, a critical consideration in MET, apart from degree of effort, duration and frequency of use, involves the direction in which the effort is made. This may be varied, so that the operator’s force is directed towards overcoming the restrictive barrier (created by a shortened muscle, restricted joint, etc. ); or indeed opposite forces may be used, in which the operator’s counter-effort is directed away from the barrier. There is general consensus among the various osteopathic experts already quoted that the use of postisometric relaxation is more useful than reciprocal inhibition in normalizing hypertonic musculature. This, however, is not generally held to be the case by experts such as Lewit and Janda, who see specific roles for the reciprocal inhibition variation. Osteopathic clinicians such as Stiles and Greenman believe that the muscle which requires stretching (the agonist) should be the main source of ‘energy’ for the isometric contraction, and suggest that this achieves a more significant degree of relaxation, and so a more useful ability to subsequently stretch the muscle, than would be the case were the relaxation effect being achieved via use of the antagonist (i.e. using reciprocal inhibition). Following on from an isometric contraction – whether agonist or antagonist is being used – there is a refractory, or latency, period of approximately 15 seconds during which there can be an easier (due to reduced tone) movement towards the new position (new resistance barrier) of a joint or muscle. Liebenson (1989, 1990) describes three basic variations which are used by Lewit and Janda as well as by himself in a chiropractic rehabilitation setting. Lewit’s (1999) modification of MET, which he calls postisometric relaxation, is directed towards relaxation of hypertonic muscle, especially if this relates to reflex contraction or the involvement of myofascial trigger points. Liebenson (1996) notes that ‘this is also a suitable method for joint mobilisation when a thrust is not desirable’. The hypertonic muscle is taken, without force or ‘bounce’, to a length just short of pain, or to the point where resistance to movement is first noted (Fig. 1.3). The patient gently contracts the affected hypertonic muscle away from the barrier (i.e. the agonist is used) for between 5 and 10 seconds, while the effort is resisted with an exactly equal counterforce. Lewit usually has the patient inhale during this effort. This resistance involves the operator holding the contracting muscle in a direction which would stretch it, were resistance not being offered. The degree of effort, in Lewit’s method, is minimal. 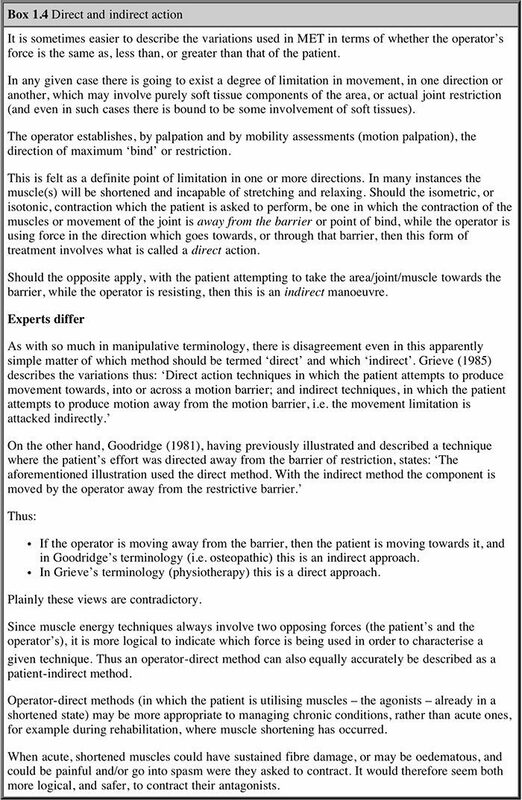 The patient may be instructed to think in terms of using only 10 or 20% of his available strength, so that the manoeuvre is never allowed to develop into a contest of strength between the operator and the patient. After the effort, the patient is asked to exhale and to let go completely, and only when this is achieved is the muscle taken to a new barrier with all slack removed but no stretch – to the extent that the relaxation of the hypertonic muscles will now allow. Starting from this new barrier, the procedure is repeated two or three times. In order to facilitate the process, especially where trunk and spinal muscles are involved, Lewit usually asks the patient to assist by looking with his eyes in the direction of the contraction during the contracting phase, and in the direction of stretch during the stretching phase of the procedure. The key elements in this approach, as in most MET, involve precise positioning, as well as taking out slack and using the barrier as the starting and ending points of each contraction. During relaxation (in which the shortened musculature is taken gently to its new limit without stretching) the stretch reflex is avoided – a reflex which may be brought about even by passive and non-painful stretch (see Mattes’ views p. 3). He concludes that this method demonstrates the close connection between tension and pain, and between relaxation and analgesia. The use of eye movements as part of the methodology is based on research by Gaymans (1980) which indicates, for example, that flexion is enhanced by the patient looking downwards, and extension by the patient looking upwards. Similarly, sidebending is facilitated by looking towards the side involved. These ideas are easily proved by self-experiment: an attempt to flex the spine while maintaining the eyes in an upwards (towards the forehead) looking direction will be found to be less successful than an attempt made to flex while looking downwards. These eye-direction aids are also useful in manipulation of the joints. 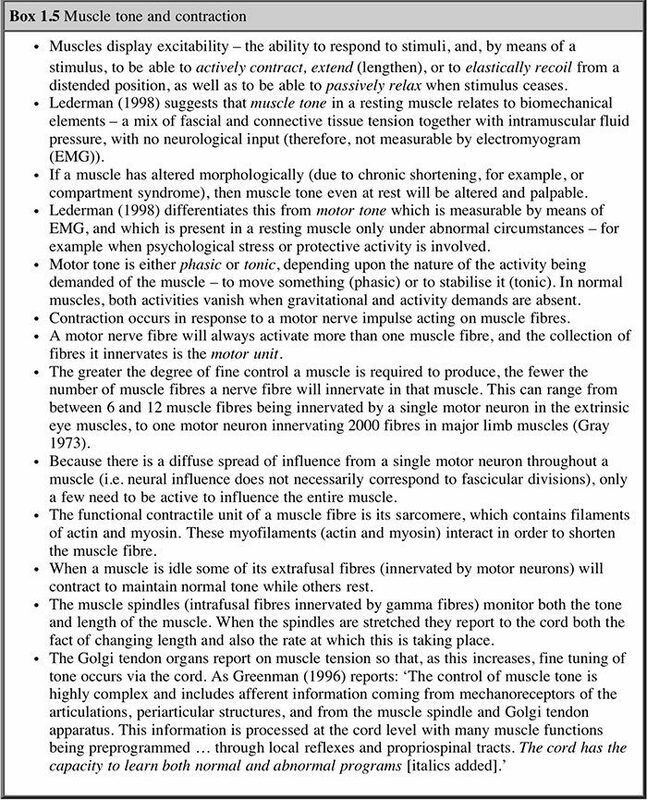 Lewit (1999) discusses the element of passive muscular stretch in MET and maintains that this factor does not always seem to be essential. In some areas, self-treatment, using gravity as the resistance factor, is effective, and such cases sometimes involve no element of stretch of the muscles in question. 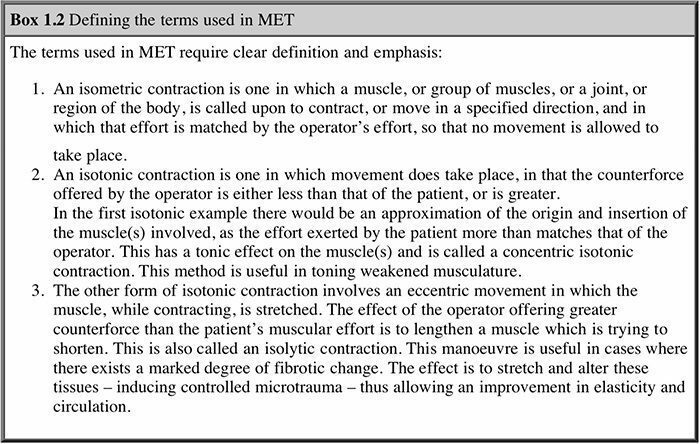 Stretching of muscles during MET, according to Lewit (1999), is only required when contracture due to fibrotic change has occurred, and is not necessary if there is simply a disturbance in function. He quotes results in one series of patients in his own clinic in which 351 painful muscle groups, or muscle attachments, were treated by MET (using postisometric relaxation) in 244 patients. Analgesia was immediately achieved in 330 cases and there was no effect in only 21 cases. These are remarkable results by any standards. Lewit suggests, as do many others, that trigger points and ‘fibrositic’ changes in muscle will often disappear after MET contraction methods. He further suggests that referred local pain points, resulting from problems elsewhere, will also disappear more effectively than where local anaesthesia or needling (acupuncture) methods are employed. The shortened muscle is placed in a mid-range position about halfway between a fully stretched and a fully relaxed state. The patient contracts the muscle isometrically, using a maximum degree of effort for 5–10 seconds while the effort is resisted completely. On release of the effort, a rapid stretch is made to a new barrier, without any ‘bounce’, and this is held for at least 10 seconds. The patient relaxes for approximately 20 seconds and the procedure is repeated between three and five times more. Some sensations of warmth and weakness may be anticipated for a short while following this more vigorous approach. The affected muscle is placed in a mid-range position. The patient is asked to push firmly towards the restriction barrier and the operator either completely resists this effort (isometric) or allows a movement towards it (isotonic). Some degree of rotational or diagonal movement may be incorporated into the procedure. On ceasing the effort, the patient inhales and exhales fully, at which time the muscle is passively lengthened. Another major muscle energy variation is to use what has been called isokinetic contraction (also known as progressive resisted exercise). In this the patient starts with a weak effort but rapidly progresses to a maximal contraction of the affected muscle(s), introducing a degree of resistance to the operator’s effort to put the joint, or area, through a full range of motion. The use of isokinetic contraction is reported to be a most effective method of building strength, and to be superior to high repetition, lower resistance exercises (Blood 1980). It is also felt that a limited range of motion, with good muscle tone, is preferable (to the patient) to having a normal range with limited power. Thus the strengthening of weak musculature in areas of permanent limitation of mobility is seen as an important contribution in which isokinetic contractions may assist. Isokinetic contractions not only strengthen the fibres which are involved, but also have a training effect which enables them to operate in a more coordinated manner. There is often a very rapid increase in strength. Because of neuromuscular recruitment, there is a progressively stronger muscular effort as this method is repeated. Isokinetic contractions, and accompanying mobilisation of the region, should take no more than 4 seconds at each contraction in order to achieve maximum benefit with as little fatiguing as possible, either of the patient or the operator. Prolonged contractions should be avoided. The simplest, safest, and easiest-to-handle use of isokinetic methods involves small joints, such as those in the extremities. Spinal joints may be more difficult to mobilise while muscular resistance is being fully applied. The options available in achieving increased strength via these methods therefore involve a choice between either a partially resisted isotonic contraction, or the overcoming of such a contraction, at the same time as the full range of movement is being introduced (note that both isotonic concentric and eccentric contractions will take place during the isokinetic movement of a joint). Both of these options should involve maximum contraction of the muscles by the patient. Home treatment of such conditions is possible, via self-treatment, as in other MET methods. Another application of the use of isotonic contraction occurs when a direct contraction is resisted and overcome by the operator (Fig. 1.4). This has been termed isolytic contraction, in that it involves the stretching, and sometimes the breaking down, of fibrotic tissue present in the affected muscles. Adhesions of this type are reduced by the application of force by the operator which is just greater than that being exerted by the patient. This procedure can be uncomfortable, and the patient should be advised of this. Limited degrees of effort are therefore called for at the outset of isolytic contractions. This is an isotonic eccentric contraction, in that the origins and insertions of the muscles involved will become further separated, despite the patient’s effort to approximate them. In order to achieve the greatest degree of stretch (in the condition of myofascial fibrosis, for example), it is necessary for the largest number of fibers possible to be involved in the isotonic contraction. Thus there is a contradiction in that, in order to achieve this large involvement, the degree of contraction should be a maximal one, and yet this is likely to produce pain, which is contraindicated. It may also, in many instances, be impossible for the operator to overcome. This stretches the muscles which are contracting (TFL shown in example) thereby inducing a degree of controlled microtrauma, with the aim of increasing the elastic potential of shortened or fibrosed tissues. The patient should be instructed to use about 20% of possible strength on the first contraction, which is resisted and overcome by the operator, in a contraction lasting 3–4 seconds. This is then repeated, but with an increased degree of effort on the part of the patient (assuming the first effort was relatively painless). This continuing increase in the amount of force employed in the contracting musculature may be continued until, hopefully, a maximum contraction effort is possible, again to be overcome by the operator. In some muscles, of course, this may require a heroic degree of effort on the part of the operator, and alternative methods are therefore desirable. Deep tissue techniques, such as neuromuscular technique, would seem to offer such an alternative. The isolytic manoeuvre should have as its ultimate aim a fully relaxed muscle, although this will not always be possible. Aging affects the function of connective tissue more obviously than almost any organ system. Collagen fibrils thicken, and the amounts of soluble polymer decrease. The connective tissue cells tend to decline in number, and die off. Cartilages become less elastic, and their complement of proteoglycans changes both quantitatively and qualitatively. The interesting question is how many of these processes are normal, that contribute blindly and automatically, beyond the point at which they are useful? Does prevention of aging, in connective tissues, simply imply inhibition of cross linking in collagen fibrils, and a slight stimulation of the production of chondroitin sulphate proteoglycan? The effects of various soft tissue approaches such as NMT and Muscle energy techniques will impact directly on these tissues as well as on the circulation and drainage of the affected structures, which suggests that the ageing process can be influenced. Destruction of collagen fibrils, however, is a serious matter (for example when using isolytic stretches), and although the fibrous tissue may be replaced in the process of healing, scar-tissue formation is possible, and this makes repair inferior to the original tissues, both in functional and structural terms. An isolytic contraction has the ability to break down tight, shortened tissues and the replacement of these with superior material will depend, to a large extent, on the subsequent use of the area (exercise, etc. ), as well as the nutritive status of the individual. Collagen formation is dependent on adequate vitamin C, and a plentiful supply of amino acids such as proline, hydroxyproline and arginine. Manipulation, aimed at the restoration of a degree of normality in connective tissues, should therefore take careful account of nutritional requirements. The range of choices in stretching, irrespective of the form of prelude to this – strong or mild isometric contraction, starting at or short of the barrier – therefore covers the spectrum from all- passive to all-active, with many variables in between. Many may prefer to use the variations, as described above, within individual settings. The recommendation of this text, however, is that they should be ‘mixed and matched’ so that elements of all of them may be used in any given setting, as appropriate. Lewit’s (1999) approach seems ideal for more acute and less chronic conditions, while Janda’s (1989) more vigorous methods seem ideal for hardy patients with chronic muscle shortening. Muscle energy techniques offers a spectrum of approaches which range from those involving hardly any active contraction at all, relying on the extreme gentleness of mild isometric contractions induced by breath-holding and eye movements only, all the way to the other extreme of full-blooded, total- strength contractions. Subsequent to isometric contractions – whether strong or mild – there is an equally sensitive range of choices, involving either energetic stretching or very gentle movement to a new restriction. We can see why Sandra Yale (in DiGiovanna 1991) speaks of the usefulness of MET in treating extremely ill patients. Many patients present with a combination of recent dysfunction (acute in terms of time, if not in degree of pain or dysfunction) overlaid on chronic changes which have set the scene for their acute current problems. It seems perfectly appropriate to use methods which will deal gently with hypertonicity, and more vigorous methods which will help to resolve fibrotic change, in the same patient, at the same time, using different variations on the theme of MET. Other variables can be used which focus on joint restriction, or which utilise RI should conditions be too sensitive to allow PIR methods, or variations on Janda’s more vigorous stretch methods (see Box 1.1). Discussion of common errors in application of Muscle energy techniques will help to clarify these thoughts. Poor results from use of Muscle energy techniques may relate to an inability to localize muscular effort sufficiently, since unless local muscle tension is produced in the precise region of the soft tissue dysfunction, the method is likely to fail to achieve its objectives. Also, of course, underlying pathological changes may have taken place, in joints or elsewhere, which make such an approach of short-term value only, since such changes will ensure recurrence of muscular spasms, sometimes almost immediately. MET will be ineffective, or cause irritation, if excessive force is used in either the contraction phase or the stretching phase. The keys to successful application of Muscle energy techniques therefore lie in a precise focusing of muscular activity, with an appropriate degree of effort used in the isometric contraction, for an adequate length of time, followed by a safe movement through the previous restriction barrier, usually with patient assistance. Use of variations such as stretching chronic fibrotic conditions following an isometric contraction and use of the integrated approach (INIT) mentioned earlier in this chapter represent two examples of further adaptations of Lewit’s basic approach which, as described above, is ideal for acute situations of spasm and pain. To Stretch Or To Strengthen? As one looks at a patient’s protruding abdomen, one might think that the abdominal muscles are weak, and that treatment should be geared towards strengthening them. By palpating the abdomen, however, one would not feel flabby, atonic muscles which would be the evidence of weakness; rather, the muscles are tight, bunched and shortened. This should not be surprising because here is an example of muscle working overtime maintaining body equilibrium. In addition these muscles are supporting the sagging viscera, which normally would be supported by their individual ligaments. As the abdominal muscles are freed and lengthened, there is a general elevation of the rib cage, which in turn elevates the head and neck. Attention to tightening and hardening these supposedly weak muscles via exercise, observes Solit, results in no improvement in posture, and no reduction in the ‘pot-bellied’ appearance. Rather, the effect is to further depress the thoracic structures, since the attachments of the abdominal muscles, superiorly, are largely onto the relatively mobile, and unstable, bones of the rib cage. Shortening these muscles simply achieves a degree of pull on these structures towards the stable pelvic attachments below. The approach to this problem adopted by Rolfers is to free and loosen these overworked and only apparently weakened tissues. This allows for a return to some degree of normality, freeing the tethered thoracic structures, and thus correcting the postural imbalance. Attention to the shortened, tight musculature, which will also be inhibiting their antagonist muscles, should be the primary aim. Exercise is not suitable at the outset, before this primary goal is achieved. 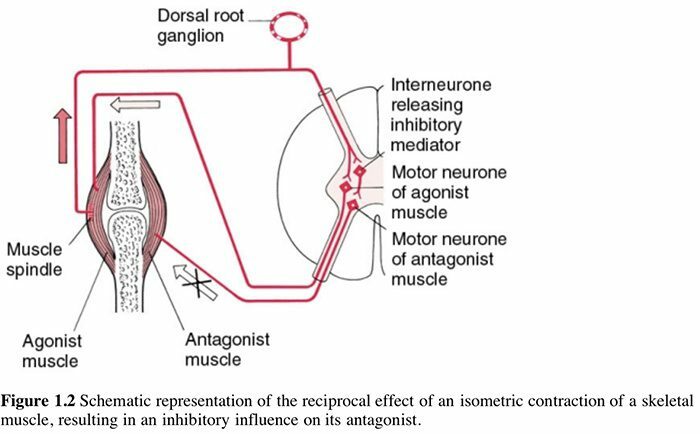 Clinical experience, and especially therapeutic results, support the assumption that (according to Sherrington’s law of reciprocal innervation) tight muscles act in an inhibitory way on their antagonists. Therefore, it does not seem reasonable to start with strengthening of the weakened muscles, as most exercise programmes do. It has been clinically proved that it is better to stretch tight muscles first. It is not exceptional that, after stretching of the tight muscles, the strength of the weakened antagonists improves spontaneously, sometimes immediately, sometimes within a few days, without any additional treatment. This sound, well-reasoned, clinical and scientific observation, which directs our attention and efforts towards the stretching and normalizing of those tissues which have shortened and tightened, seems irrefutable, and this theme will be pursued further in Chapter 2. Muscle energy techniques are designed to assist in this endeavor and, as discussed above, also provides an excellent method for assisting in the toning of weak musculature, should this still be required, after the stretching of the shortened antagonists, by use of isotonic methods. When the tension on the muscles, and hence the tendon, becomes extreme, the inhibitory effect from the tendon organ can be so great that there is sudden relaxation of the entire muscle under stretch. This effect is called the lengthening reaction, and is probably a protective reaction to the force which, if unprotected, can tear the tendon from its bony attachments. Since the Golgi tendon organs, unlike the [muscle] spindles, are in series with the muscle fibres, they are stimulated by both passive and active contractions of the muscles. Pointing out that muscles can either contract with constant length and varied tone (isometrically), or with constant tone and varied length (isotonically), he continues: ‘In the same way as the gamma efferent system operates as a feedback to control the length of muscle fibers, the tendon reflex serves as a reflex to control the muscle tone’. In terms of longitudinal soft tissue massage, these organs are very interesting indeed, and it is perhaps the reason why articulation of a joint, passively, to stretch the tendons that pass over the joint, is often as effective in relaxing the soft tissues as direct massage of the muscles themselves. Indeed, in some cases, where the muscle is actively in spasm, and is likely to object to being pummelled directly, articulation, muscle energy techniques, or functional balance techniques, that make use of the tendon organ reflexes, can be most effective. Sandler believes that massage techniques cause a decrease in the sensitivity of the gamma efferent, and thus increase the length of the muscle fibres rather than a further shortening of them; this produces the desired relaxation of the muscle. Muscle energy techniques provides for the ability to influence both the muscle spindles and also the Golgi tendon organs. 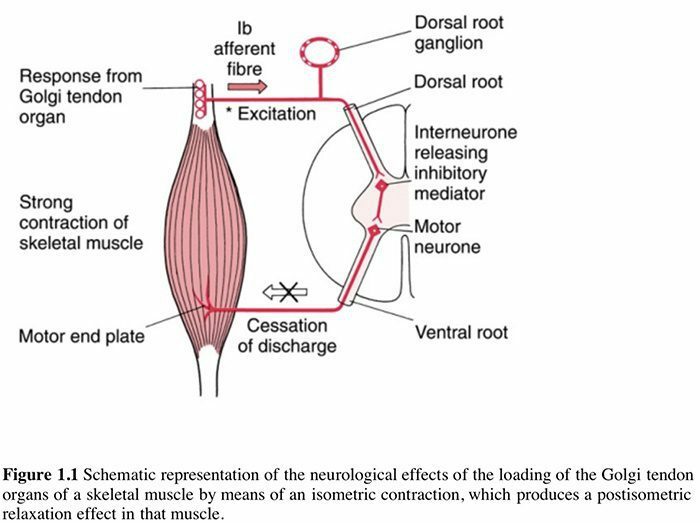 Bourdillon (1982) tells us that shortening of muscle seems to be a self-perpetuating phenomenon which results from an over-reaction of the gamma-neuron system. It seems that the muscle is incapable of returning to a normal resting length as long as this continues. While the effective length of the muscle is thus shortened, it is nevertheless capable of shortening further. The pain factor seems related to the muscle’s inability thereafter to be restored to its anatomically desirable length. The conclusion is that much joint restriction is a result of muscular tightness and shortening. The opposite may also apply where damage to the soft or hard tissues of a joint is a factor. In such cases the periarticular and osteophytic changes, all too apparent in degenerative conditions, are the major limiting factor in joint restrictions. In both situations, however, Muscle energy techniques may be useful, although more useful where muscle shortening is the primary factor. The restriction which takes place as a result of tight, shortened muscles is usually accompanied by some degree of lengthening and weakening of the antagonists. A wide variety of possible permutations exists in any given condition involving muscular shortening which may be initiating, or be secondary to, joint dysfunction combined with weakness of antagonists. A combination of isometric and isotonic methods can effectively be employed to lengthen and stretch the shortened groups, and to strengthen and shorten the weak, overlong muscles. The health of any joint is dependent upon a balance in the strength of its opposing muscles. If for any reason a flexor group loses part, or all of its function, its opposing tensor group will draw the joint into a hyperextended position, with abnormal stress on the joint margins. This situation exists in the lumbar spine of modern man. Lack of attention to the muscular component of joints in general, and spinal joints in particular, results in frequent inappropriate treatment of the joints thus affected. Correct understanding of the role of the supporting musculature would frequently lead to normalisation of these tissues, without the need for heroic manipulative efforts. Muscle energy techniques and other soft tissue approaches focus attention on these structures and offer the opportunity to correct both the weakened musculature and the shortened, often fibrotic, antagonists. The mixture of tightness and weakness seen in the muscle imbalance process alters body segment alignment and changes the equilibrium point of a joint. Normally the equal resting tone of the agonist and antagonist muscles allows the joint to take up a balanced position where the joint surfaces are evenly loaded and the inert tissues of the joint are not excessively stressed. However if the muscles on one side of a joint are tight and the opposing muscles relax, the joint will be pulled out of alignment towards the tight muscle(s). Such alignment changes produce weight-bearing stresses on joint surfaces, and result also in shortened soft tissues chronically contracting over time. Additionally such imbalances result in reduced segmental control with chain reactions of compensation emerging (see Ch. 2). Several studies will be detailed (Chs 5 and 8) showing the effectiveness of Muscle energy techniques application in diverse population groups, including a Polish study on the benefits of Muscle energy techniques in joints damaged by haemophilia, and a Swedish study on the effects of Muscle energy techniques in treating lumbar spine dysfunction, as well as an American/Czech study involving myofascial pain problems. In the main, the results indicate a universal role in providing resolution or relief of such problems by means of the application of safe and effective muscle energy techniques. Goodridge J P 1981 Muscle energy technique: definition, explanation, methods of procedure. Royal Society of Medicine 1983 Connective tissues: the natural fibre reinforced composite material.